We were within a few miles of Selma, Alabama, when we saw a sign that said “Lowndes County Interpretive Center.” I’d read about it on the National Park Service website but wasn’t planning on stopping because I thought that the NPS interpretive center in downtown Selma would be more convenient. 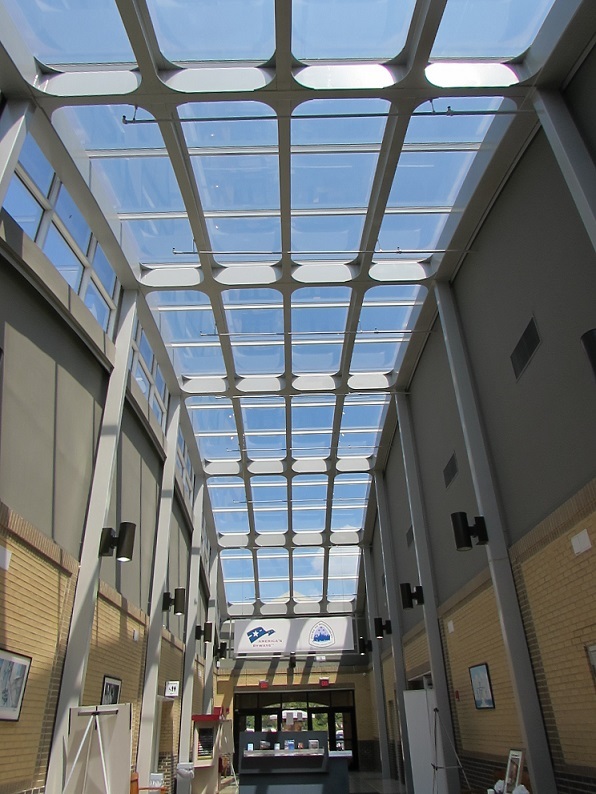 But since we were there…. “Let’s stop!” I said, just as we were about to pass the entrance. Mr. History Tourist took a sudden and sharp right onto the access road. He’s mastered the husbandly art of acting now and asking questions later. It turned out to be the best decision we made on the entire trip. In 1963, an organized effort began, in Selma, to register voters and desegregate services. The powers-that-be retaliated against the African Americans who tried to register, by evicting them from their homes, firing them from their jobs, fire-bombing their churches, shooting them, arresting them, and generally harassing and intimidating them. With no jobs and no houses – most were sharecroppers for whom jobs and homes were linked — African Americans ended up living in tent cities built on property owned by African Americans. A fun night for white deliquents in Selma in 1964 was driving out to the tent cities and spraying them with bullets while the occupants slept. 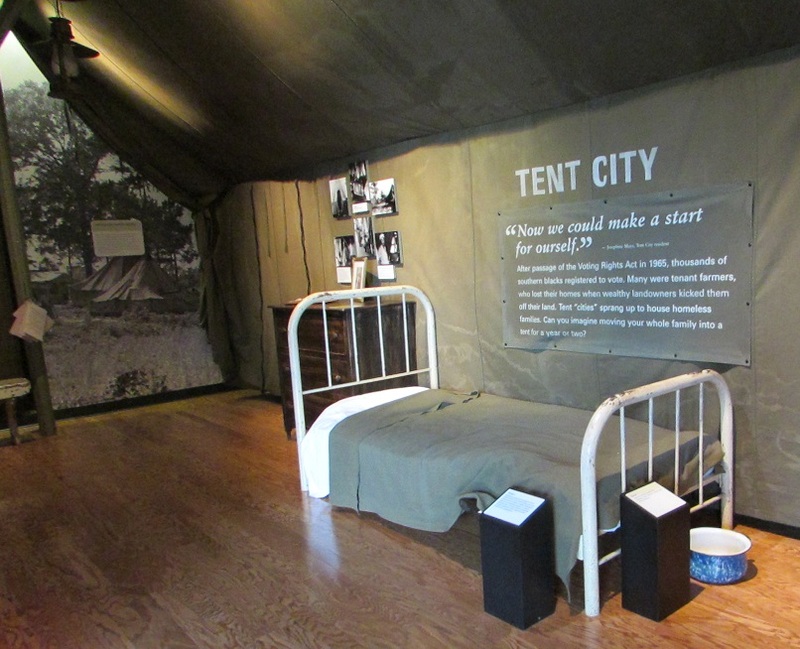 The Lownes County Interpretive Center is built on the site of the largest of the tent cities. There were no – zero, zilch, nada – African Americans registered to vote in Lowndes County until 1965. The Center tells the story of the voter registration efforts in general, and of the tent cities specifically, in Lowndes County. In 1965, Civil Rights activists planned a 60ish mile protest march from Selma to Montgomery, the capitol of Alabama. 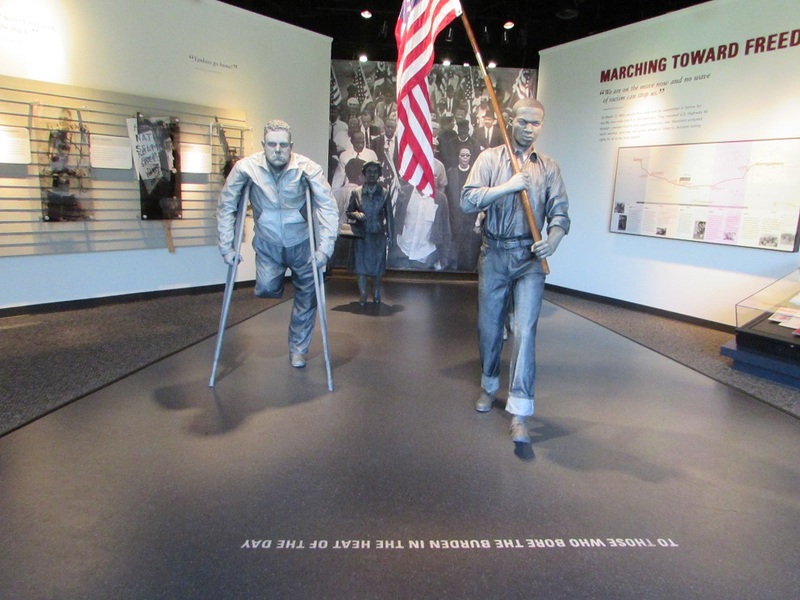 On March 7, they started at Brown Chapel and got less than two miles, to the Edmund Pettus Bridge, when State troopers attack them in an event now known as Bloody Sunday. If you stand behind the marchers in the first photo, you’ll notice that they’re marching toward a large picture window. 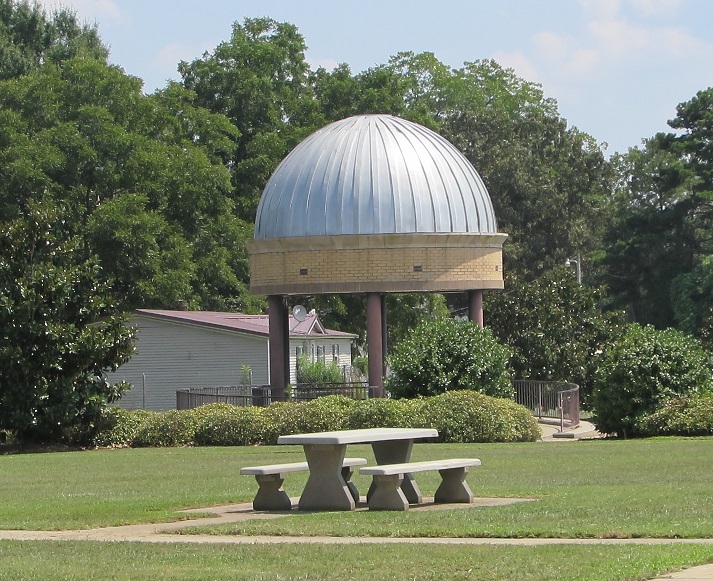 Look out the window and you’ll see this domed structure on the far side of the park. It represents the state capitol building in Montgomery, where the marchers were headed. I admit I knew only the very basics of the story — there were voting issues, there was a march, there was a clash — going into the center. Both Mr. HT and I came out not only knowing about the events, but understanding the policies and motivations (thanks in large part to Ranger Bates). We got into the car and drove on. We now knew that the road we’d just driven from Montgomery, State Route 80, was the same road that the marchers took when they finally (on try #3) made the entire march. A few miles later, we got to the Selma border and crossed over the Edmund Pettus Bridge. Gallery | This entry was posted in Alabama and tagged civil rights, Lowndes, Selma, tent cities. Bookmark the permalink. Wow! Looks like a wonderful interpretation of the Selma history. I love when the impromptu stops turn out to be just good ones! I’m not a particularly spontaneous traveler but it always seems better when the unexpected turns out well. One of the things about Selma was that we didn’t have high expectations — it was just suppose to be a quick stop at the bridge — and it turned out to be completely and wonderfully charming. Good story. A pity it was such a recent event. It always freaks me out to know that incidents that seem like they should be ancient history actually happened in my lifetime. I don’t remember it, but Grant — who is the same age as I — remembers watching it on television. It always horrifies me to think that I was born less than 10 years after the end of WW2. In my time Vietnam, ISIL, Northern Ireland, 9/11 and Civil Rights to name but a few. Now we have complete political, economic and social breakdown in Syria and its neighbours.